Times are tough. We're all looking to stretch our budgets, so the thought of paying $20 or more for a PC game from a commercial development studio is, well, a tough download to swallow. But in your effort to save money, you need not sacrifice winning gameplay. Independent gaming studios are releasing awesome titles—many with an addictive retro vibe—and their prices range from free to next-to-nothing. Here are five you must check out today. Your wagon seems to have achieved low earth orbit. Super Wagon Adventures is a twisted take on the classic game Oregon Trail that many of you may remember playing in high school. If you don’t remember this game, I may have just dated myself, and I retract my previous statement. 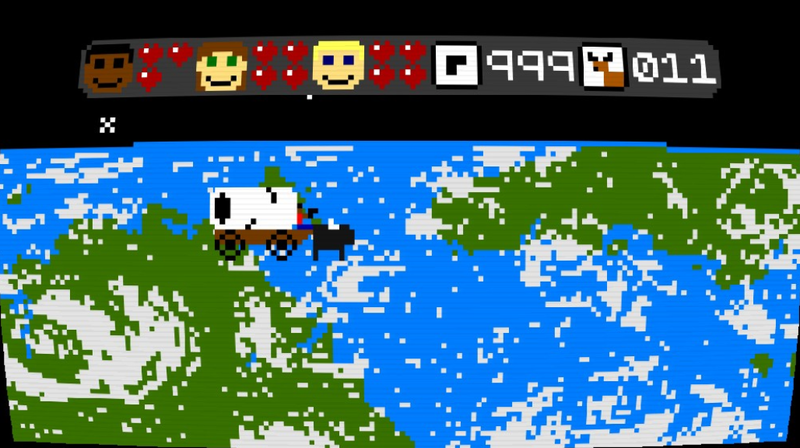 The original game had the player assuming the role of wagon leader in the 1800s traveling west across the Oregon Trail. You hunted for food, tried to survive, and, more often than not, died of dysentery. This version of the game, developed by a Seattle-based indie developer who goes by the handle Sparevector, is similar in style to the original Oregon Trail game, but with quite a number of odd turns. As you play, you randomly come across aliens, achieve low earth orbit and time travel, and eat mysterious mushrooms. All this happens, and you just need to try to stay alive. The full game (if you don’t die early) only takes 10 minutes to beat, but mastering the W-A-S-D key controls and twitch shooting will take some practice. New wagons have special weapons and characteristics that are unlockable, and a survival mode exists for those who want to tackle a limitless stream of angry bears or wolves. Even with a good looking 'stache, running sometimes is the best option. Moustache King Adventure was born out of the indie game development competition 'A Game By Its Cover', and is a platforming adventure that’s similar to Zelda II: The Adventure of Link but has the look of Max and The Magic Marker. 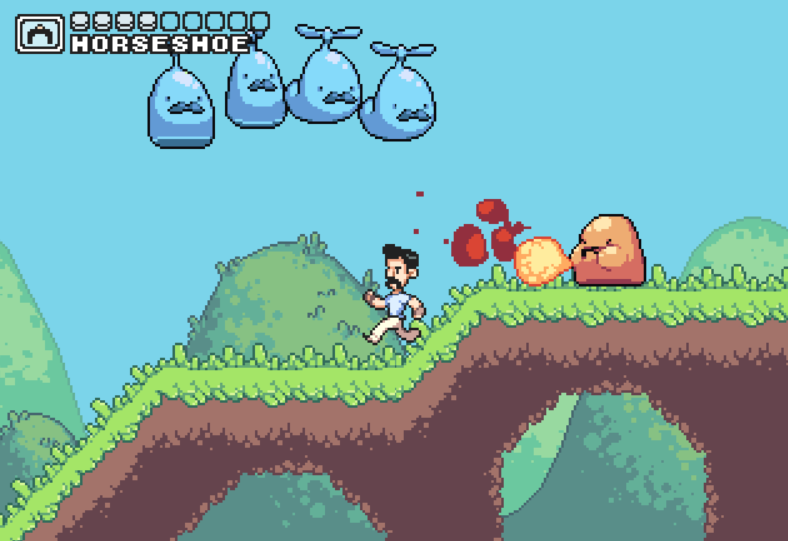 After meeting the Moustache King as a young boy in this game, you set out to become the Moustache King a decade later. You accomplish this by working your way up the ranks and fighting a variety of witting Barons. You can dash, jump, and punch (with some basic form of punch combos). The game's controls feel simple and responsive. Tins of moustache wax give you health upgrades (of course), and stopping off at the barber shop will restore your energy. The game doesn’t take itself too seriously but does add some leveling mechanics and moustache upgrades. In fact, most everything revolves around the moustache in this game. Towns in Moustache King Adventure have many different characters to talk with, and secret pathways offer up an added layer to each location. The game includes catapults that can warp you to other towns as a means of fast travel, and there are also weird bloblike enemies who sport (of course) moustaches. You Have To Win The Game (YHTWTG) by developer Pirate Hearts delivers a classic 1980s PC aesthetic. This game is pretty self-explanatory, but it’s not that easy. 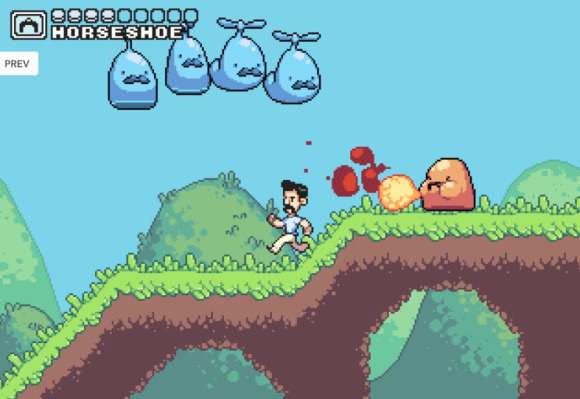 The game is a retro-platformer that has you running, jumping, and exploring a CGA-inspired world of caves. 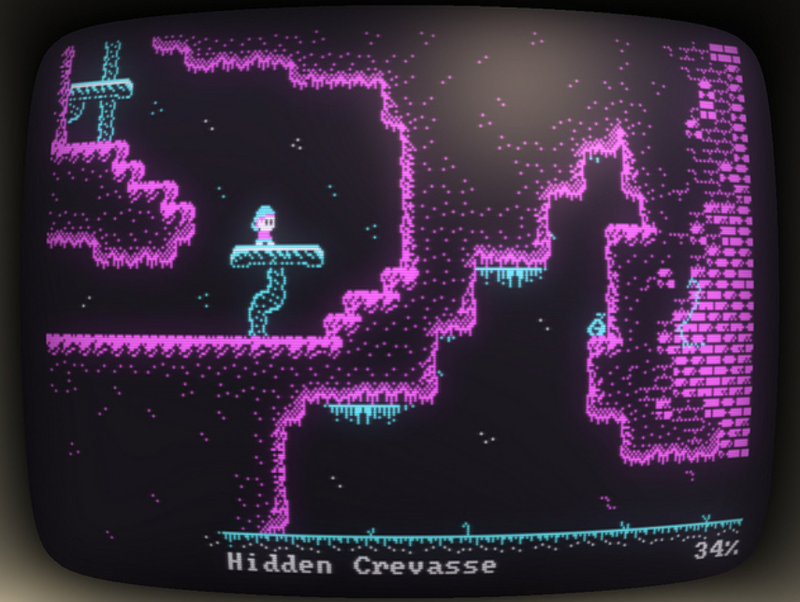 The way this game is presented, with a look reminiscent of one displayed on a curved CRT monitor, is sort of brilliant. It feels like an old game. An old game that you can’t stop playing. What I liked most about YHTWTG is the simplicity of the gameplay—there's no need to remember eight different button commands and combos. I remember saying to myself “just one more board” because of its simple and addictive style. The completion percentage display at the bottom right of the screen is also a very clever carrot on the stick. You feel inadequate if you can’t get to at least 30 percent of completion, or maybe just 40 percent. Each room, or screen, is called something different, with some based on movie quotes and other modern references. Additionally, the game doesn’t murder you with lousy checkpoints. All the save points seem to make sense, and, with an ‘old school’ game like this, that's very important. Difficult games can be fun, but difficult games without save points can be maddening. Robotic tentacles are no match for my mighty laser gun things. 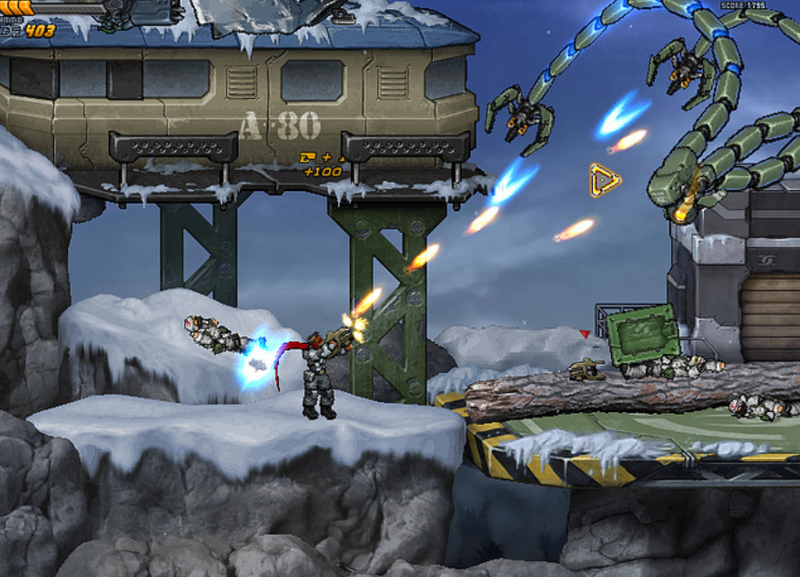 Intrusion 2 by Aleksey Abramenko (yes, just one man) is a side-scrolling shooter that brings an added element of a physics engine to the genre. Obvious comparisons to games like the Metal Slug series and Bionic Commando are challenged by the different way each firefight plays out. With added physics and blow-apart rag-doll action, each battle feels different and unique. For instance, while playing this game, I shot a tree stump so that it fell into some boulders and pushed a robot that was attacking me off a ledge, where it got trapped amidst the rubble until I blasted it to kingdom come. It takes a little time to get used to moving with the classic (configurable) W-A-S-D keys and using the mouse to shoot but, once you get the hang of it, the accuracy of how you’re shooting the combo is a cool addition to the genre. What’s the story? You are a very awesome Russian guy infiltrating a base that has a ton of robots who want to stop you from doing just that. Oh, and you can ride a wolf! 'Nuff said. Not where I expected to find my chair this morning. 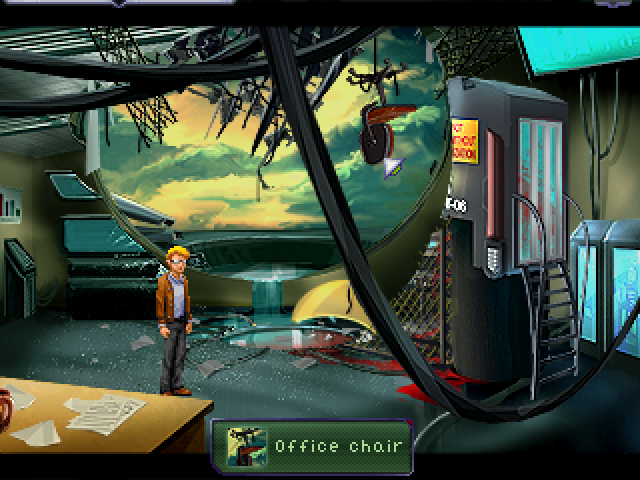 Resonance is a 1990s-esque adventure game that features four characters with intertwined stories. The story revolves around the death of a particle physicist and his highly sought-after technology. The very captivating intro to this game and the mere fact that it involves a particle physicist was enough for me to jump on board. One of the most notable things about this game is the ease with which it presents itself. Playing the game always feels intuitive, and the drag-and-drop mechanics seem to work just as you think they should. That may not sound like a lot (especially in this world of complex 3D graphics, rendering, and real-time lighting) but in an adventure game, it’s everything. If how you interact with the world as you try to piece together what comes next is broken, you might not care to continue. The aesthetic in this game is also very appealing, and the old-school graphics never seem to get in the way. The ambient sounds are great, and the overall presentation of the game had me just staring at this little world, clicking, and not coming up for air. The game was developed by XII Games and Wadjet Eye Games, which already have released quite a few titles, including Infinity Bit, Anna, and Gemini Rue. 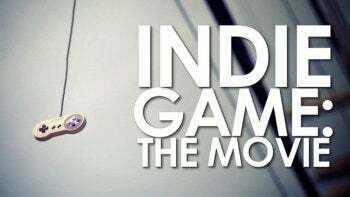 If you want to learn more a little more about indie games in general—what it takes to make, publish, and distribute them—check out Indie Game: The Movie. This documentary looks at two different independent game developers (Team Meat and Phil Fish) and how their lives changed during the development of indie games Super Meat Boy and Fez.